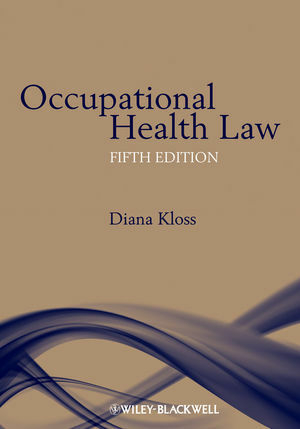 Kloss on 'Occupational Health Law' has become the standard reference work on the subject since it was first published in 1989. Detailed but highly readable, it provides an essential source of information for health professionals working in occupational health and also for human resources staff. In the years since the 4th edition was written there have been many changes in the field of occupational health, which has achieved a higher profile nationally with the publication of Dame Carol Black's review of the health of Britain's working age population in 2008. This edition, which has been fully revised, includes new sections on age discrimination and expert witnesses, and the sections on discrimination, especially disability discrimination, the Working Time Regulations, stress related illness, corporate manslaughter and confidentiality, in particular, have been substantially updated. Professor Diana Kloss MBE is Chair of the UK Council for Work and Health, a barrister and former part-time employment judge. She is visiting professor at London South Bank University, Honorary Senior Lecturer in Occupational Health Law in the University of Manchester, and has considerable experience of employment law and occupational health law, both in practice and as a lecturer and researcher. Diana is an ACAS arbitrator and mediator and a former member of the Industrial Injuries Advisory Council. She has been appointed as a member of one of the NICE Public Health Advisory Committees. In 2009 she was appointed MBE for services to occupational health. 3.2 How long should records be kept? 4.8 Does the job applicant have to answer the employer’s questions?